(5) Be the Force of Goodness. The book is written in a “pick-your-style” format—you can dip in at any point and find something of value. You can try to implement a way a day, or work on one way for a week. Just one or two new insights from the 30 ways presented in the book can be the key to having greater happiness and meaning in your life, career, and relationships. 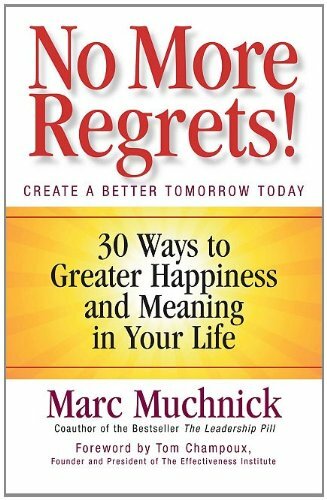 What I thought was useful: There were a lot of good tips in this book on recognizing your regrets and how to acknowledge them. The first part of the book was very useful and filled with some very common sense approaches to learning to let go of regrets. This book was all about living your best life from this point forward! What I thought was lacking: This book was a little bit repetitive. It had a lot of very well-known approaches in it but nothing seemed to be “new” or “unique”. The way the book was laid out also seemed to be a bit out of order to me but I think that is because of the audio. Audiobook Review: Marc read the book perfectly but whoever published the audio didn’t do a real great job with layout. There are 3 times in the 2.5 hours where it appears they are skipping chapters but they aren’t really—just reading a bunch of chapters and chapter titles. It was distracting. Why I gave it a 3: I did find some of the information really useful and felt all the tips were good to know. I just didn’t find the book mind-blowing. I also think I would have liked it more in paper book format! Who I would recommend it too: Anyone looking for a simple, straight forward approach to recognizing and living with regrets. I would recommend getting the print copy though–the audio was a little distracting.